Zahi Hawass talking about the impacts of tourism on archaeology. "A Brussels museum will hand over to Egypt a limestone relief that had been smuggled out of the country more than 30 years ago, an Egyptian antiquities official said Monday. The Royal Museum of Art and History in Brussels, Belgium, agreed to return the relief, which was stolen from the Giza tomb of a 5th dynasty priest, Senenu, said Zahi Hawass, the secretary general of Egypt's Supreme Council of Antiquities. In return, an archaeological mission belonging to the museum will be allowed to continue its work in Egypt, he said". A big welcome to Nancy, who posted the previous feature, and is now going to be a member of this blog. Until we can figure out why the Membership functionality won't work, her postings will still be in my name, but we hope to have that sorted soon. Hopefully this will help to cover some of the glaring gaps when I go away for a few days! "Archaeologists digging in a 5,600-year-old funeral site in southern Egypt unearthed seven corpses believed to date to the era, as well as an intact figure of a cow's head carved from flint. The American-Egyptian excavation team made the discoveries in what they described as the largest funerary complex ever found that dates to the elusive five-millennia-old Predynastic era, Egypt's Supreme Council of antiquities said Wednesday. "This is a major discovery, and will add greatly to our knowledge of the period when Egypt was first becoming a nation," said Zahi Hawass, Egypt's Chief archaeologist. In the area of Kom El-Ahmar, known in antiquity as Hierakonpolis, 370 miles (600 miles) south of Cairo, the team working for five years in the area excavated a complex thought to belong to a ruler of the ancient city who reigned around 3600 B.C. The find is significant because little is known about the early phase of Predynastic period. That era predates the unification of upper and lower Egypt that triggered the well-known Dynastic era, when ancient Egypt's pharaohs ruled. Little remains from the Predynastic period. Objects that have survived are either in bad shape or have been smuggled out of the country. grave sites at Kom El-Ahmar appear to date to the early Naqada II era, a time when the settlement at Hierakonpolis was at its peak and the city was the largest urban center on the Nile. The complex, which is enclosed in a well-preserved wall of wooden posts, consists of a large rectangular tomb covered with the earliest known superstructure. Against the enclosure wall in an ash-laden deposit, excavators came across a complete figurine of a cow head carved from flint. Diggers found a flint figure of an ibex in the same tomb, now on display in the Egyptian Museum in Cairo. Hawass said Egyptian flint figurines are extremely rare. Only 50 have been discovered to date. He said the uncovering two fine examples in one site is a stroke of luck. Excavators also found 46 limestone fragments from Egypt's earliest lifesize human statue, along with fragments of two ceramic funerary masks and a collection of fine pots that point to the date of the complex. Although the tomb and its surroundings were severely plundered in antiquity, excavators unearthed four bodies at one end of the tomb. The position of the corpses suggests that they may belong to sacrificed servants or prisoners who were buried at the foot of the grave, a common practice in the 1st Dynasty, Hawass said. Eight deep post-holes, four on each side, were found at the longest side of the burial chamber, three of which still bear remains of the ancient wooden posts. Six more post-holes to the east, in two rows, suggest the presence of an offering chapel. Excavations at the site started in 2000 under the leadership of famed Egyptologist Barbara Adams, who died in 2002. The work continues under Renee Friedman, the current head of the American team". "On Sunday, May 15 at 9 p.m. ET/PT, the National Geographic Channel premieres "King Tut's Final Secrets," a high-tech forensic investigationunveiling new findings related to his death and the first-ever reconstructionof his face and head using revolutionary 3-D CT scan imaging -- revealing whathe looked like on the day he died. This groundbreaking research is alsofeatured as the cover story of National Geographic magazine's June issue. This two-hour world premiere special follows Dr. Zahi Hawass, leadingarchaeologist and National Geographic Explorer-in-Residence, as he and a teamof Egyptian scientists remove the mummy from its sarcophagus for the firsttime in more than 25 years. The goal: use state of the art CT scan technologyto solve the mystery surrounding King Tut's death". See the article for more. "Salvaged from an ancient garbage dump in Egypt, the collection is kept at Oxford University in England. Known as the Oxyrhynchus Papyri, the collection includes writings by great classical Greek authors such as Homer, Sophocles, and Euripides. Using a technique called multi-spectral imaging, researchers have uncovered texts that include parts of a lost tragedy by Sophocles, the 5th-century B.C. Athenian playwright; sections of a long-vanished novel by Lucian, the second-century Greek writer; and an epic poem by Archilochos, which describes events that led to the Trojan War". See the article for more. The main contents are listed at this link - see below for links to specific features. The latest issue of Archaeology Magazine has a feature (both in the print version of the magazine, and online) about the Tanis collection, which, though it has produced some fabulous grave goods from royal tombs, is relatively little-known when compared to sites like the tomb of Tutankhamun. This article describes the discoveries of Pierre Montet, who found these beautiful finds after 11 years of endevour, and remembers this excavator who is very much in the shadow of more famous colleagues. There is also a set of online items entitled "TutWatch" inspired by the currently touring Tutankhuman exhibtion, which is now in the US. It looks at the subject from a number of perspectives, also has the schedule of the exhibition. More about Kathryn Bard's Mersa Gawasis (Red Sea) sea vessel find. The results will be formally presented on April 23 during the 56th annual meeting of the American Research Center in Egypt (ARCE) in Cambridge, Massachusetts. Nothing new, but probably the best summary of the finds, to date. "This season the Alexandrina Bibliotheca, one of the major cultural edifices in Egypt, held an exhibition entitled " Faces from Egypt", following which it released a book under the same title written by Mustafa Al Razaz and Ahmed Abdul Ghani. The book includes a panorama of Egyptian faces through history. The book inspired this week's article.The art of portrait in Egypt extends back more than 7000 years, since pre-historic times. The diverse creative abilities of the Egyptians, their experimental and expressionistic approaches and fine expression of human feelings have been clearly evident in their heritage of portraits through Pharaohnic times, the Graeco-Roman ages, the Coptic era and Islamic age up until modern times". See article for more. The controversial best-seller 'Moses and Akhenaten' by Ahmed Othman is the basis of the new Hollywood mega-production, entiltled 'Nefertiti'. Apparently, it is soon to be filmed on location at the Egyptian Media Production City. John Heyman, a Hollywood producer, film distributer and film financier (whose production credits include Black Gunn, A Passage to India, Jesus, Hitler - The Last Ten Days and Daniel) will be involved in the project. The article inter-twines the history of Akhenaten with the story behind the film. Quite fun. "As one of the seven ancient wonders of the world, one of the most unique monuments on the globe -- and one that must be protected -- the Giza Pyramids are listed on UNESCO's World Heritage list. To mark this year's World Heritage Day, the Supreme Council of Antiquities (SCA) chose 'Giza at the turn of the century' as the theme of an exhibition of photographs and artefacts that attempt to shed light on this distinguished archaeological site, its controversial history, and recent discoveries there". A much longer article, by Nevine El-Aref. This is a new website (went live on 1th April 2005) dedicated exclusively to the Ancient Egyptian Language. It has a professional feel to it, is nicely laid out, easy to navigate and has some useful information organized by category, including books (which can be purchased via Amazon in Canada, the US or the UK), and advice on how/if to become an Egyptologist. Some of the sections are not 100% complete, but samples show what they will look like when finished. A news section and a discussion groups are only available by registering with the site,. It promises an attractive programme of online courses future, including an online hieroglyph course, which the site’s owner, PhD candidate Nicole Hansen, claims will be the first of its type to be offered. There are 14 discussion group categories, available by registering. "I am sitting on the window-sill in my room eating sugar-cane. It is so juicy and fresh one could go on nibbling at it all day. The Soudanese servant, in a green cap and full green trousers, just now brought in a basket-full cut up into pieces, and set it down on the floor with a wide smile. My window is high above the ground; beneath, the whitewashed walls of the hotel ache in the midday glare; across the sand I can see the two great Pyramids, all their colour bleached out by the fierce light. But early this morning they looked very different. Just as the sun rose I came to this window and saw them standing there drowsily splendid, a tigerish gold set on the tigerish sand". An extract from "Lotus and Pyramid" by Constance Sitwell in 1928, on the Travellers In Egypt website. See the site to read more. "A joint American-Egyptian archaeological team has excavated what is believed to be the largest ever discovered pre-dynastic funerary complex near the Upper Egyptian city of Edfu, antiquities officials said on Wednesday . . . An SCA statement said on Wednesday that the complex 'consists of a large rectangular tomb covered with the earliest known superstructure and a wooden offering table' ". This is a very important find, probably dating to Naqada II, c.3600bc. It is being speculated that it belonged to one of the rulers of Hierakonpolis, the most important of the urban centres during Naqada II. limestone fragments of an "earlier human life-size statue were found along with fragments of two ceramic funerary masks and a collection of fine pots that indicate the date of the funerary complex". A number of news items . . .
New book chronicles Egyptian archeology's institutions ("Hidden Treasures of Ancient Egypt is a new book by Dr Zahi Hawas Secretary General of the Supreme Council of Antiquities. The author takes his readers on a tour of some of the most exquisite artifacts in the Egyptian Museum and acquaints them with adventures that led to their discovery in the mid l9th and 20th centuries - see article for more details"). UNESCO sign to recognise Egypt's international heritage ("A billboard bearing the slogan of international heritage will be placed on Egyptian archaeological sites included on the UNESCO list of international human heritage. The slogan symbolises the link between natural and cultural heritage"). Ain Shams sites to be renovated ("The current areas of Ain Shams and Mataryia were known in ancient Egypt as Oun, the capital of the l3th nom (province) of Lower Egypt. In the Greek age, the name was changed into Heliopolis, which means the city of the sun. Heliopolis had a religious and historic significance as the centre of the worship of the sun"). A fair dedicated to Egypt's heritage, focusing on "Giza Treasures through Ages" has been organized by the Supreme Council of Antiquities at the Egyptian Museum, to coincide with International Heritage Day. Not much more following on from the Independent article, but some more comments re this important find. "For more than a century, it has caused excitement and frustration in equal measure - a collection of Greek and Roman writings so vast it could redraw the map of classical civilisation. If only it was legible. In the past four days alone, Oxford's classicists have used it to make a series of astonishing discoveries, including writing by Sophocles, Euripides, Hesiod and other literary giants of the ancient world, lost for millennia. They even believe they are likely to find lost Christian gospels, the originals of which were written around the time of the earliest books of the New Testament". See the Independent article for more. Bill Manley, hieroglyph expert has been trying to find the identify of the skeletal remains of a woman and child found by Sir Flinders Petrie at Qurneh nearly 100 years ago. There is the possibility that the remains represent royal personages because of the tomb's contents, including a gilded coffin and the luxurious grave goods, including gold jewellery. However, the hieroglyphs that might have identified the owner of the coffin and tomb haev been lost due to the decay of the plaster on which they were inscribed. But now Bill Manley believes that, thanks to work with a range of other experts, he has discovered the likely identity of the woman. Hawass's occasional piece in Al Ahram Weekly focuses this week on three mosiacs from Alexandria which have recently bee restored. A fascinating description (and moral tale) of the modern fate of the extremely important site of Bubastis in the Delta: "The ancient city of Bubastis provides an example of how an important ancient Egyptian Delta city was slowly and systematically destroyed in modern times until little remained amidst Zagazig's urban expansion apart from miscellaneous architectural elements, broken stelae and statues". Well worth reading. "Culture Minister Farouk Hosni unveils next month the Sobek temple in Kom Ombo, which bas been restored at a cost of LE 15 million . . . Minister Hosni will also inaugurate a new museum displaying mummified crocodiles and built near the restored temple, dedicated to the principal deities of ancient Kom Ombo". "Mortuary rituals of Ancient Egypt are compared to those surrounding the death of Pope John Paul II and his predecessor, John Paul I. Kim Stacey, writer and anthropologist, takes a closer look at the power of a well-crafted ritual from the past and present, to identify similarities and differences." "Harvey Weiss, professor of archaeology at Yale University, says climate change was a fact of life for earlier civilizations. From pharaohs to the medieval Vikings, swift and sometimes violent changes in weather patterns sparked mass migrations and technological innovations like irrigation." The article goes on to discuss past climate change in general terms. April seems to be the month for museums in Egypt. The latest announcement concerns a fund-raising campaign for the Grand Egyptian Museum. Designed by a prize-winning architectural frm, the museum is described as "making more than a passing nod to the landscape of the desert". 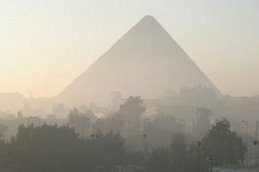 It will be located on the Giza Plateau, near the Great Pyramids, and will house collections organized by theme. There will also be an auditorium, conference rooms and other facilities. It seems unclear where the money is coming from, however. Farouk Hosni asked, in a speech to a press conference, for the international community to to help raise the funding necessary for the project, projected at $550,000,000, and also suggested that local support from Egypt might be appropriate, perhaps by public subscription. The World Bank have declined to invest in the project. They are hoping that the project will be completed (the museum, not the fund-raising) by 2009. The current Cairo museum in Tahrir Square will continue to house some 10,000 artefacts after the GEM is constructed. Mummies at the Bowers Museum in California have been subjected to CT scans in the latest fashionable round of mummy-scanning. Of the six mummies examined, one was a priest from a wealthy family, one was a young girl who sang during religious rituals and another was a child, buried in a finely carved wooden coffin. The scans will be included in an exhibition scheduled to open on the 17th April at the Bowers Museum. "Under the title of 'The Nile and Water Resources in Egypt through the Ages, the fifth Fayyoum conference took place this week at Cairo University's Faculty of Archaeology, Fayyoum Branch". A short description follows in the article about the topics discussed at the conference. "Al-Arish National Museum for North Sinai history will be opened by the Minister of Culture Farouk Hosni, next month. The museum occupies 2km square and will contain over 300 antiquities taken from eight other national museums, the Head of the Museum Sector, Mahmoud Mabrouk, said". There are a few more lines in the article. "The Wadi el-Hitan area in Fayyoum is to be developed into the country's largest open museum for whales and fossils," said the Minister of State for Environmental Affairs, Maged George. He noted that this was part of a larger project to develop Wadi el-Rayan protectorate in order to conserve the environment for both scientific and tourism purposes. The project team consists of experts from Michigan University in the United States, the Egyptian Ministry of Environment, the Geological Survey Authority and Fayyoum Governorate". This is the entire article from the State Information Service. "The highs and lows of the Nile River have shaped the course of Egyptian civilization for more than 8,000 year". This article, written by Professor Fekri Hassan, is only the in print version of the magazine Geotimes, and there are no more details about it on the web page. Egypt Today's April edition summary of the Tutankhamun scan, including Hawass's plans for future work on mummy remains. "A place that the king can call home has been the subject of debate for years. Should he move back to Meet Raheena, his original home? Or find more sumptuous new digs at the Grand Egyptian Museum (GEM) planned for the Giza Plateau?" "An Egyptian Antiquity delegation will soon fly to Paris to participate in the "Nubia Campaign: Yesterday and Today" exhibition. It has been organized by UNESCO headquarters in Paris on 13 April. This exhibition gives a retrospective look at the Nubia Campaign, which began with a drive to safeguard Nubian monuments and has since seen the opening of the Nubia Museum in Aswan and the National Museum of Egyptian Civilization in Cairo". The article on the State Information Service website contains more information. "For the past 36 years journalist and author Desmond Zwar has shared a great secret: that it was not archaeologist Howard Carter who was responsible for the discovery of Tutankhamen's tomb, but a humble British corporal whose very presence on the site had to be kept confidential; who in the last days of the dig took a photograph that changed history". This article claims that Richard Adamson, a 23 year old spy who infiltrated the Wafdist party, was responsible for the initial find of Tuthankhamun's tomb. Hawass's occasional column in Al Ahram Weekly is focused in this issue on the Paris exhibition "The Glory of the Pharaohs" which focuses mainly on the work of two important early French Egyptologists. He describes taking the heads of state of Egypt and France (President Hosni Mubarak, Mrs Mubarak, President Jacques Chirac and Mrs Chirac) around the exhibition and recounts what he showed them and some of the comments made. The Culture Minister, Farouk Hosni, has announced the opening in May 2005 of the Amheteb Museum in Saqqara. It will house some 2000 items found within the Saqqara area. The project has taken three years to complete. "Spanish scientists have developed the first technique that can determine the color of wine used in ancient jars. They analyzed residues from a jar found in the tomb of King Tut and found that it contained wine made with red grapes." This is the first major project carrying out chemical analysis in the tomb, and the results are to be published in the journal Analtyical Chemistry.